For the second straight year opening night was not one for celebration for the #15 Seward County Saints as Seward fell behind early and trailed for the final 28 minutes of the game as Northern Oklahoma-Enid came into the Greenhouse and picked up an 81-74 win in the Pepsi Classic. Things started well for the Saints as a pair of big early threes from sophomore Tyreke Sharp put the Saints on top 12-6 six minutes into action. 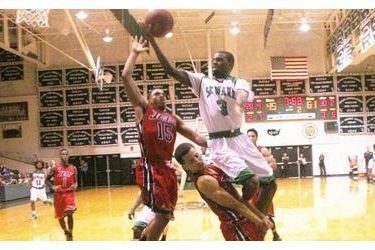 However, a 4:30 dry stretch for Seward without a single point watched their lead evaporate and Northern Oklahoma turned the tables on them, going on a 14-0 run to take a 20-12 lead of their own. After a Verdell Mays bucket stopped the Jet run, back to back three point plays, one of the old fashioned variety and one of the long ball variety from Kevin Sims knotted the score at 20 with 8:40 left in the half. Enid took the lead back on a long rebound and run out and the Jets slowly added to their lead before taking a 34-26 advantage into the break. The Saints shot just 27% in the first half and outside of Sharp, managed just 16% from the field. Seward’s struggles continued as the second half got underway and Enid took a 12 point lead three minutes into the final period. The Jet lead ballooned to 21 midway through the half and it looked like an inexperienced Saints team was in for a beating on their home floor. Still down by 19 moments later, the Saints finally showed some life, going on a 13-4 run to get back to within striking distance with the score 69-59 and 4:56 remaining. With under a minute remaining, a pullup three by Nick Singleton got the Saints to within five and after Enid scored on their next possession, a Sims three drew the Saints to within four at 76-72. That was as close as Seward would get as Enid knocked down their free throws down the stretch and a pair of Saint turnovers halted their chances at a miracle as Northern Oklahoma handed the Saints a 81-74 loss to open the 2014 season. The Saints offense had trouble getting going all night as they finished the game shooting just 39% from the field while connecting on just 7 of 27 three point attempts. Enid made their money at the line in the win, hitting 24 of 28 freebies and outscoring Seward 24-14 from the stripe. Sims led Seward with 21 points as well as a team high 7 rebounds in the loss while Sharp pitched in 18 on 5 of 7 shooting and Singleton added 12 in his Seward debut. The Saints lose on opening night at home for the second consecutive year for the first time in school history. Seward will look to bounce back Saturday night at 8:00 as they take on Redlands to wrap up the 2014 Pepsi Classic.